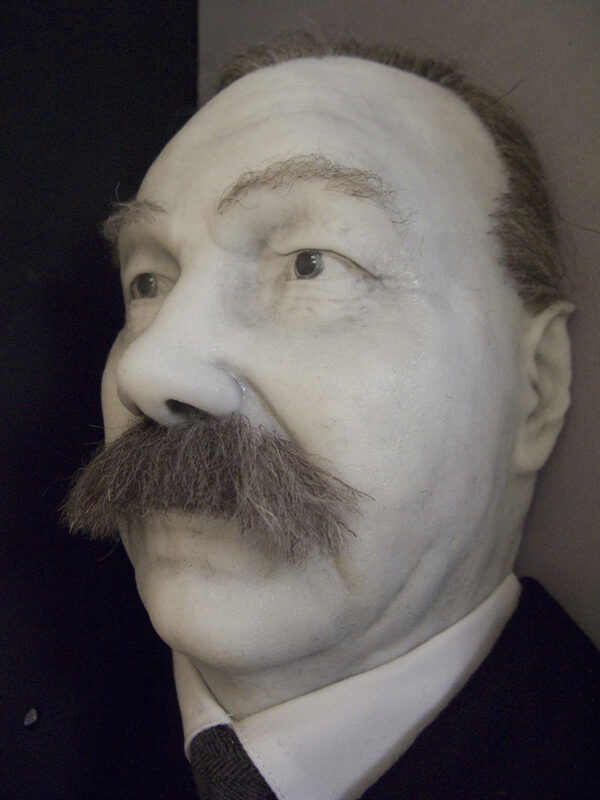 The bust of Sir Arthur Conan Doyle posed numerous challenges, and not just because of the ghostly apparition needed to accompany it. Alongside the more technical disciplines of digital sculpting, photogrammetry and laser scanning, the designers also needed to kick-start the process with intensive research into human anatomy. Not only that, but they had to understand numerous forms of anatomy, with the skeleton, muscle/flesh and pores/wrinkles coming under three separate strands (primary, secondary and tertiary). Only understanding and being able to apply this varied range of skills – and learning which is the best fit for each aspect – could the end result meet the high standards expected of it. To ensure the best result, the development team even underwent a Portrait Anatomy workshop, to help understand the process of building up bones and muscle, layer-by-layer, in the final build. Not only was there the technical and anatomical distinctions to weigh up, careful consideration had to be given to other factors that would influence the final design and how effective it would be for the desired audience. Colour contrast, design and texture all needed to be considered, to make it both accessible and impactful. This wasn’t just a concern at the start of the project but all throughout, as testers and focus groups fed back on their hands-on experience with the prototype. To ensure the needs of the target demographic were met, a number of focus groups were held, to gain qualitative and quantitative feedback. Attendees were presented with different models – some that had been 3D printed and others that were manufactured using traditional methods. They were then quizzed on the feel of each item, to ensure they found it appealing. Further questioning on the project as a whole helped drive further decision making and helped influence the direction it would go on to take. Anything that felt damp or spongy was off-putting, so the eyeballs were brought back from the brink of hyperrealism. How the focus group reacted with certain materials and shapes was only half the story – of course. The preferences of the group had to then be correlated with the technical requirements, to make an end product that didn’t just feel nice but was also functional. It was to this end that the decision was made to create a bust of Doyle using a solid structure for the head, bone and muscle (that was to be 3D printed), with a silicone face pulled over the top, to represent skin. There were still more challenges to come. Most photographs of Doyle show him looking straight ahead – there are very few with him in profile. For this reason, the design team had to turn from art to science, to create a model that would be the best estimation of his likeness in profile. Sculpting the head was a slow and laborious process, but one made somewhat easier by the use of two Doyle busts currently in the Portsmouth City Council collection. These were not permitted to leave Portsmouth Central Library, but the development team could still make use of them through portable scanners. These scanners were subsequently taken to the library to help create the likeness we have today. As with many aspects of this project, however, it wasn’t as straightforward as scanning the bust and considering it a job well done. The scanner is known for having difficulty with shiny objects – and as the busts were designed to resemble bronze – this could prove problematic. Not only that, the busts were of a younger Arthur Conan Doyle, instead of the much older figure seen in the spiritualism image on which the project was based. Later in the process, the bust needed tweaking to make it look older. Ordinarily, the user could mirror brush strokes to halve their workload, but as the Doyle bust was asymmetrical, it made for a more labour-intensive process. When it was time to scan the bust, a rig of diffused lighting (homemade with a table cloth and foam rings) and a smooth, bespoke turntable were used to minimise errors. Then, a few attempts were taken to iron out any issues encountered along the way, with more sophisticated technologies used at each. 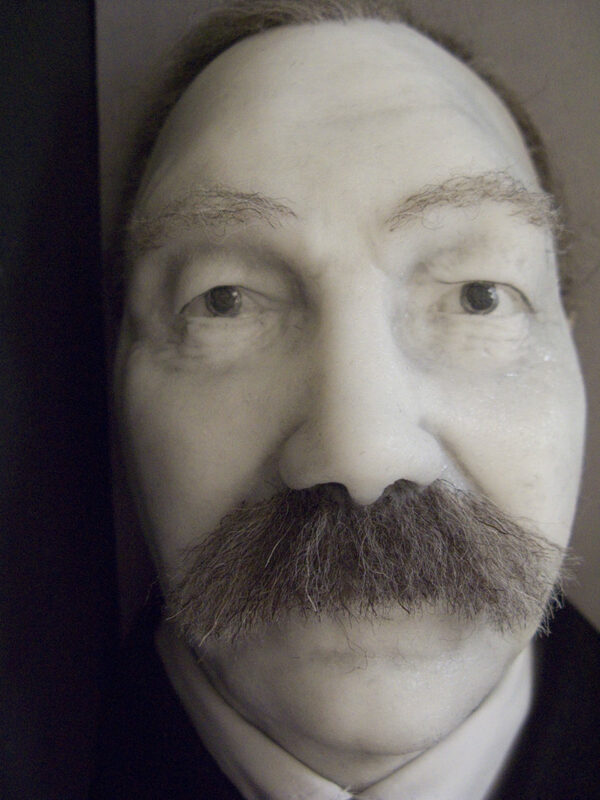 Eventually, some 162 photos were taken of the bust, which were then used to create its duplicate (albeit with a hole in the top of the head, which needed remedying before print).